The latest versions of Smile's PDF-editing apps for the Mac get richer and deeper options, but remain much the same. You can’t avoid handling PDF (Portable Document Format) files: every website and program seems to generate them, either as a preferred choice or an option. And, often, you need to make some tweak or change in a PDF or fill it out when it hasn’t been set up by its creator to have preset form elements. But I’ve found in my own work and in correspondence with both design pros and regular users that Acrobat is obscure and hard to master, and Preview typically insufficient. It’s into this gap that Smile developed PDFpen ($75) and PDFpenPro ($125), which have matured for many years as an alternative. PDFpenPro is as full featured as Acrobat in nearly every respect and PDFpen just a little less so, while Smile offers each at a standalone price that’s reasonable. It’s much easier to master either app than Acrobat, and Smile has retained a consistent but routinely improved interface for the software over years, unlike Adobe’s giant shifts in approach for Acrobat that leaves long-time users like me reeling. Powerful OCR works even with rough original, like this example from 1917. You can easily fix failed recognition, too. The macOS software is both exhaustively featured and generally intuitive. 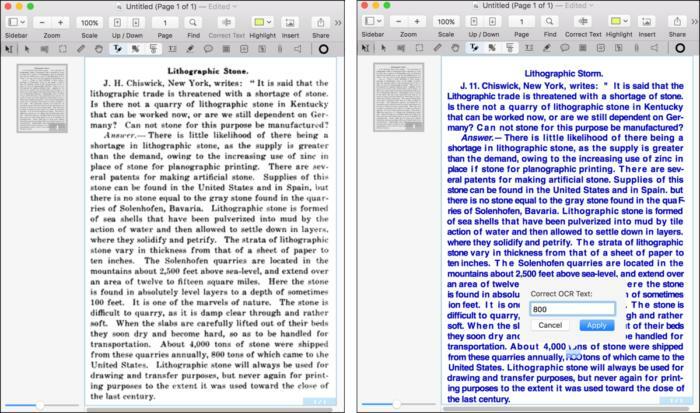 Both editions can create and edit the contents of PDFs, allow drawing and adding text on top of files, and include excellent optical character recognition (OCR) software. The Pro flavor is also a superb way to design forms, retrofit existing documents to contain form fields, and to fill out forms. There’s a slight awkwardness in picking, setting values for, and switching among the app’s several tools, but it’s minor compared to its utility and ease of use once you’re using a tool. Version 8 of both apps added many elements found in Acrobat that were still missing in PDFpen, like digital-signature management and validation, and new kinds of export methods from PDF to other formats, including Word. Version 9 isn’t nearly as big an upgrade, but it’s packed full of enhancements and additions, notably a large variety of image export options and better annotation management, useful when marking up a PDF. The Pro version differs from the regular by adding to its features some options that are critical to niche audiences, including Microsoft Excel, Microsoft PowerPoint, and PDF/A output and table of contents and form creation and editing. Annotations let you mark up a PDF and share the results without modifying the underlying PDF. It’s one of PDFpen’s strongest features, offering easily accessible, multiple tools for highlighting, adding comments, striking through text, and the like. However, in previous versions, it was slightly harder to work with these annotations. Version 9 makes it possible to select multiple annotations at once, copy the text, delete them, and show highlights in the Annotations sidebar view. You can also choose to print just annotations, making it easier to review comments separately from the document as another PDF or in print form. Table of contents editing in the Pro version of PDFpen brings it close to Acrobat parity. For those who require a table of contents (TOC) or need to work with one created elsewhere, Acrobat has been your best choice until now. PDFpenPro allows substantially more advanced TOC options for more sophisticated and less clunky interaction. It also now merges TOC entries when combining files. While Preview and Acrobat have had relatively robust ways to export pages from PDF into other formats, it’s one area that PDFpen has lagged in. This latest version does a bit more, adding a host of image formats and options that include 1-bit TIFF (black-and-white), grayscale export, and JPEG and PNG files. It also allows a range of image resolution (really density measured in dots per inch) in making the conversion. 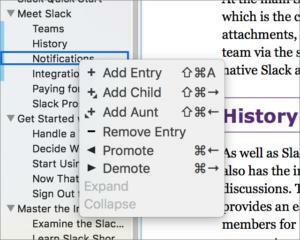 Most of the remaining version 9 changes are fiddly things everyone will appreciate (like showing resizing handles for items that are off the edge of the page), or for which people with specific needs will suddenly breathe a sigh of relief (such as horizontal OCR for ideographic languages, like Chinese, in PDFpenPro). PDFpen has seemingly nearly as many features and options as Adobe Acrobat, but I consistently find myself able to figure out how to accomplish what I want in PDFpen, while I often have to consult web documentation and poke around in Acrobat to get to where I’m going. That’s partly because Smile chose to use a straightforward toolbar (introduced a few versions back) mirrored in a Tools menu to spell it all out. One rough spot in PDFpen is its difficulty in allowing “touch-up” editing in the same font, which lead in this example to a type explosion of sorts. You can select text to copy it out, or use a Correct Text feature to edit it. PDFpen’s one drawback relative to Acrobat is how it handles dropping in revised text. Acrobat can read embedded fonts, even ones that are subsetted (including only the characters used in the document), and your “touch ups” appear in the native font whenever possible. This preserves the appearance. PDFpen drops in a default font, which makes it impossible to use to make an aesthetically usable seamless fix. You can adjust this by selecting fonts installed in OS X, but it’s not nearly as useful. In one document I tested, PDFpen splayed the edited text all over the page in different fonts; Acrobat handled editing the same text just fine. 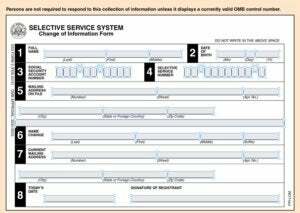 Both versions let you fill out form fields created in other software. If you need to make your own forms, the Pro versions can autogenerate form fields, or you can drop them in manually and format their appearance. Autogeneration is quite amazing: I threw scanned images—not just PDFs—at PDFpenPro that had continuous lines with labels underneath for first, middle, and last name, and other similar entries, and it correctly broke those into separate fields. Pro can even embed a button into a PDF that allows someone filling it out to submit the form data or the filled-out PDF to a Web server or send either via email. PDFpenPro recognizes complex field arrangements when automatically creating fill-in forms. The OCR software is highly accurate, even for extremely degraded text. I tried it on old newspaper pages with very small type, and it did remarkably well. On typewritten or computer output, it’s nearly perfect in my testing. Once converted, you can search on the document or display the text in an isolated layer. The Pro version lets you correct the text, too. Version 8 added digital signatures, verifying cryptographically that a document is unchanged since the creator locked it. PDFpen shows that a PDF is signed by displaying a triangular notch in the upper-right corner. If the triangle is green and has a checkmark, the app has verified it; clicking the corner brings up additional technical details. I found it wonky to sign in PDFpen in version 8, and it remains so in version 9. You have to select *Tools > Signature Field*, click on a document, draw a signature (or at least click in a drawing field), and then click *Apply Digital Signature*, at which point you can select an existing certificate or generate a self-signed one. PDFpen can make use of measurement, a feature that’s part of the PDF spec, but is typically incorporated only when architectural and other computer-aided design (CAD) software exports a PDF. With a PDF that embeds scale and units, the measuring tool displays those accordingly. But you can also use it with any PDF, where PDFpen uses the document’s explicit measurements (like 8.5 by 11 inches) as the basis of dimensions that you can opt to show in points, inches, or millimeters. The measurements can only be made one at a time, can’t be stored, and can’t be edited—only dragged from a starting to ending place, making them somewhat less useful than they could be. 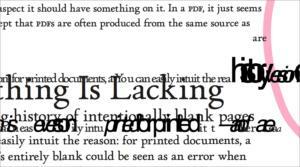 PDFs can support file attachments and annotations, and PDFpen lets a PDF act as a kind of portmanteau or a sticky-note festooned marked-up copy. PDFpen can extract file attachments and annotations, and also preview them. The basic PDFpen is more of a viewer while the Pro edition can add and delete attachments and annotations. Both versions also let you record audio annotations you can add to a PDF as well as play them back. Version 8 added local export of text and graphics as a Word file (both versions) or Excel (Pro only), where previous releases sent the PDF to Smile’s servers for processing. I exported a complicated PDF that included a very detailed table and the resulting version in Word was almost pixel perfect and fully editable. The same PDF exported to Excel in the Pro release with equally well preserved tabular detail, including merging and spanning cells. Even a PDF with little tabular data and images exported to Excel just fine. The server round-trip is still required in version 9 for PowerPoint and PDF/A (an archived format of PDF). This is a security risk, as your files wind up being exposed to Smile—regardless of how trustworthy they are and how well secured their systems are—and also requires being online. Unfortunately, during my testing of the 9.0.1 release, I experienced several crashes when performing routine tasks, some of which were “destructive,” losing changes I had made since the previous save. This happened while trying to choose annotation options in the Print dialog, while printing annotations, and while adding a digital signature field to a page. Some of the crashes seemed to occur on one pass, but after relaunching and attempting the same task, it worked without a hitch. I expect that Smile will fix whatever bugs have led to these crashes, of course, and I’ve reported them all to the company. However, more generally, my expectation with software in 2017 that manipulates documents is that they will use some form of journaling or continuous save, much as we see in Pages, BBEdit, InDesign, and other business and professional software. With those apps, even a system crash often loses no more than the last keystroke after launching the app, as it can recover the intermediate changes. This reduces my score for the app overall, and it’s an area I hope Smile puts effort into in the future, given the broad support for intermediate continuous saving in other apps. Smile sells single-user licenses for $75 and $125 for the regular and Pro versions, respectively, whether directly through the company site or through the Mac App Store. The MAS doesn’t support upgrades or family and multi-user business licenses, which can be purchased directly. Smile charges $30 for upgrades to either version, and $50 to move from PDFpen to PDFpenPro 9. Those who bought a previous version via the MAS should leave that copy installed on their Mac, and then download version 9 directly from Smile’s site. On launch, the Smile version will identify the previous MAS copy and offer upgrade pricing. Long-time users may sit this upgrade out if the list of new features isn’t compelling, although the $30 upgrade price isn’t hard to justify. New users will see very little light in the gap between Acrobat and PDFpenPro or even the regular PDFpen edition.